Nothing embodies the success of the London 2012 Olympic and Paralympic Games more than the volunteers, such as the Games Makers, London Ambassadors and Ceremony Volunteers. As the largest group of volunteers by a considerable margin, the Games Makers formed a community of their own, and they were reuniting for their 1st anniversary on 2nd February 2013 at the Hilton London Metropole. 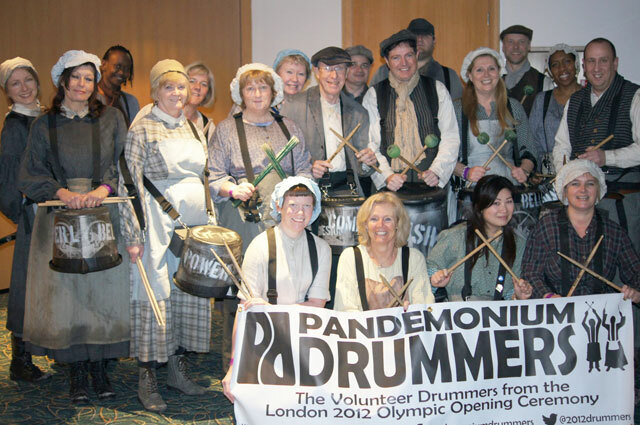 A few tickets were allocated for purchase by the Pandemonium Drummers, the volunteer performers from the London 2012 Olympic Opening Ceremony, and of course the drummers were expected to perform. I took on the organisation of this event on the Pandemonium Drummers side and designed the choreography, which included editing the video of the Pandemonium segment of the Opening Ceremony. At a site visit two weeks before the performance, I saw the potential for an engaging performance by taking advantage of the size and shape of the Balmoral Suite at the Hilton London Metropole, which has an impressive podium with two ten-step stairs into the audience. go back into the audience for a second scene. The second scene would see the drummers lined up to support a countdown with a driving beat and lead the audience into the main dining room next door, where the drummers would drum along to a song until all guests entered the room; upon my suggestion, David Bowie's Heroes was chosen in reference to the Team GB entrance at the Athlete's Parade at the Olympic and Paralympic Opening Ceremonies. At the London 2012 Ceremonies, every drummer was cued via in-ear monitors, but zero budget productions like this one do not have this option available. Memorising the structure is difficult for a volunteer amateur cast, and moving drummers are exposed to an acoustically difficult situation, as the room position can change the sound dramatically, making it hard to hear the rhythm of the music, especially when drumming at the same time. The quality of the sound system is crucial, and in this particular case, it was extremely hard to hear any detail of the music even when not drumming. I therefore decided to embed the cues into the video, which would be projected to the opposite wall of the podium, which was the main performance space. After editing, the video contained a constant visual click in the top corners and textual cues in the top centre of the video. The visual cues were very effective at the performance, and went largely unnoticed by the audience, despite being rather prominent. The mass movement itself was very well received, in particular the two sequences when the drummers entered the audience area and marched through the crowd. Detailed notes briefed the drummers about a week in advance, and despite only a single 45-minute rehearsal just before the show with an opportunity for minor tweaks, all 19 drummers followed the plan and delivered a quality show to an enthusiastic audience. Have a look at the drummers' briefing below!